Let a loved one know they are unforgettable with this cute set. 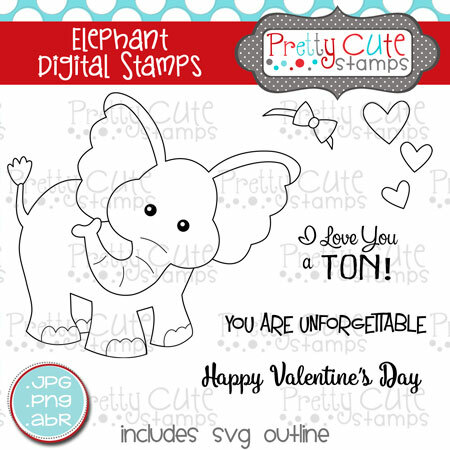 This DIGITAL�set of 6�stamps features a cute little elephant�with sentiments to match. JPG images have a white background, PNG images have a transparent background. ABR files are Photoshop and Photoshop Elements brush files. SVG outlines for the images are also included in this set. These cutting files will make cutting out your digital images a snap! You must have a program that opens SVG files and an electronic cutting machine to use�the SVG outlines. After purchase, a link to a zip file will be e-mailed to you. �Please double check your junk/spam folder if you don't receive the email quickly. Download links expire one week after purchase. I Love You a TON! ©2019 Pretty Cute Stamps. All rights reserved.